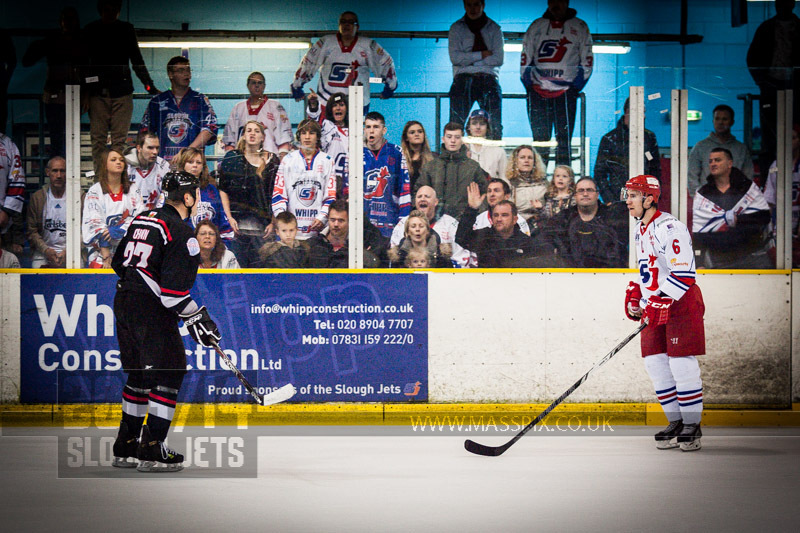 With just one game this weekend Slough Jets lined up to face the Basingstoke Bison on home ice. The visitors did the damage with three early goals putting the home team on the back foot. Joe Rand scored at 18 seconds and 2.14 with Andy Melachrino scoring in between at 1.48 to put Basingstoke 0-3 up within 134 seconds. Rand completed his hat-trick at 13.31 and Doug Sheppard made it 0-5 with 2 seconds left in the opening period with a powerplay goal. The home team conceded their sixth goal at 22.19 with Miroslav Vantroba scoring but then stage a comeback starting just after half way. Ciaran Long was taken down while breaking free on Dean Skinns and awarded a penalty shot. The home team forward out skilled the visiting goalie and put the puck into the back of the net. Darius Pliskauskas made it 2 at 35.16 and stoke 30 seconds later with an even strength goal following his powerplay goal. Long netted his second at 37.36 with a man advantage of the second period ended 4-6. The atsmophere crancked up for the final period and at 47.24 Rand found the back of the net again to widen the margin to 7. With Joe Greener picking up a double minor penalty at 57.21 Slough pulled the netminder and completed the game with the extra attacker on the ice. With 37 seconds left Mindy Kieras scored the home team’s fifth but the visitors closed out for the win. 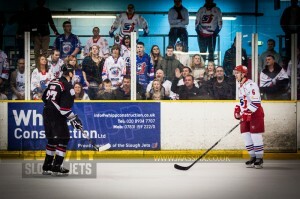 The top two teams in the league met at the Hangar with Slough Jets hosting the Manchester Phoenix. Slough got off to a rapid start with Darius Pliskauskas netting the game’s opening goal at 4.47 and his was followed by Mindy Kieras scoring at 7.20 for a 2-0 lead. Joachim Flaten finally brought the visitors back into the game with 3.47 left in the first with finishing from Tony Hand and Robert Schnabel and at 17.52 Andrew McKinney scored the equalising goal. Slough’s Aaron Connolly scored the go ahead goal at 18.41 with a powerplay goal giving Slough a 3-2 lead at the first interval. It took 3.17 of the second period for Slough to widen their lead with a powerplay goal from Frankie Bakrlik and at 27.47 Ondrej Pazivil pulled a goal back for Manchester. Bakrlik added his second goal of the night at 37.54 at Slough took the second interval 5-3 ahead. Manchester came out charged for the final period and pulled it back to 5-4 at 41.56 with Ben Wood finding the back of the net. Michal Psurny then levelled the game at 45.17 and Flaten scored his second at 50.13 on the powerplay to give the visitors their first taste of the lead. Slava Koulikov took the home team time-out at the same time but with 1.20 left in the game and Slough chasing the equalising goal McKinney scored his second to end the game 5-7. Slough Jets lined up against Guildford Flames for the first time in the new season at the Hangar. Slough took only 78 seconds to put themselves ahead in the game as Tom Carlon beat Mark Lee in net at 1.18. As you’d expect from two big teams they both enjoyed chances at each other’s end but at 16.48 Rick Plant scored the visitor’s only goal of the night while Gregg Rockman in the home net was trapped under players. The second period saw the home team take back the lead when Adam Calder scored at 30.49 in a period they dominated. While Guildford forced Rockman to make 9 saves Slough sent in 25 shots on Lee in the other net. Ryan Watt and Jez Lundin came together with 54 seconds left in the period and both received double minors. Slough enjoyed 45 seconds of powerplay to start the final period but the visitors kept them out but at 45.42 Darius Pliskauskas made it 3-1 finishing from Davies and Adam Greener. Paul Dixon called Guildford’s time-out at 58.24 and opted to pull the netminder for the extra attacker and after some big saves from man of the match Rockman, Pliskauskas found the back of the empty net to seal the score at 4-1. After taking part in what is most likely the only tie to be recorded this season Slough played Peterborough on their own home ice with league and cup points on the line. 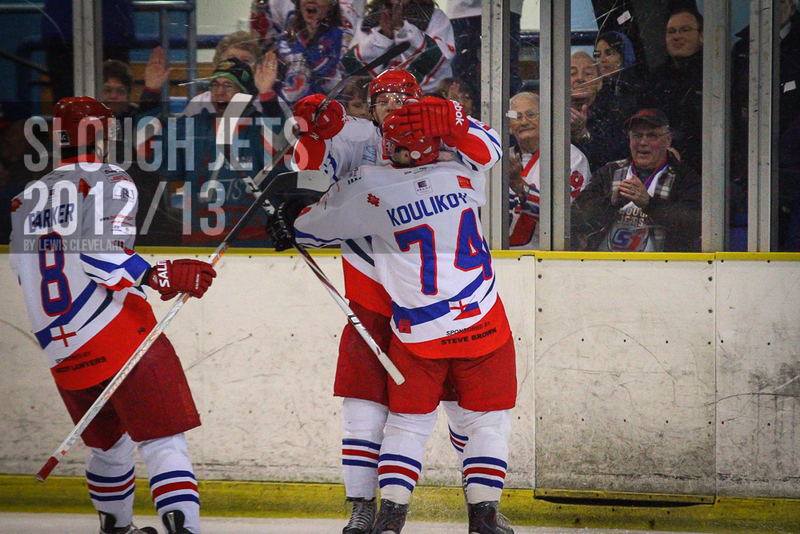 Slough took the lead early on in the game when Slava Koulikov picked up from Shaun Thompson and netted at 3.28. Soon after Slough killed their first penalty of the game and later on back at even strength James Ferrara levelled the game at 13.15 with Peterborough’s only goal. Slough killed off another penalty before the period ended. The second period followed the same way the first period was played. 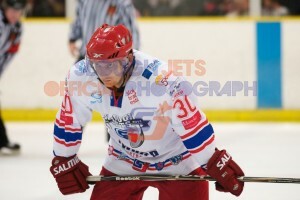 Slough killed off two penalties before taking back the lead when Darius Pliskauskas scored at 32.46. During a spell of four on four play in the final period Billy Phillips netted his first goal of the season at 46.02 to make it 3-1 before Peterborough picked up their first spell shorthanded which ended gifting the home team a 5 on 3 advantage they failed to capitalise on. Even 1.50 at the end of the game with an empty net failed to let Peterborough pull back and Slough completed their win. Slough Jets welcomed Guildford Flames back to the Hangar for their second visit of the season with tonight’s points being for the league competition only. The teams exchanged early goals with the score level at 1-1 within the first minutes. Rick Plant scored for Guildford at 3.00 but Dan Davies equalised at 4.46 and Slough never looked back. Another quick goal exchange followed when Peter Poljacek netted for Slough at 16.17 on the powerplay only to see Plant score his second 20 seconds later. Peter Jasik put Slough ahead with his strike at 18.09 and the home team went to the interval 3-2 ahead. The second period saw Slough outshot but not outplayed as they forge a game winning lead. After killing a penalty Slough’s next penalty saw them extend their lead with Ciaran Long scored a short-handed goal from his knees at 28.15. Long netted again at 35.29 to give Slough a two goal lead. Guildford again enjoyed the shot advantage in the third period but Gregg Rockman wasn’t to be beaten as he kept out all 10 shots. A brief Guildford powerplay was nullified when they picked up a penalty leaving it 4 on 4 but neither team could take advantage of the open ice and Slough failed to capitalise on their brief powerplay. Guildford pressed hard for the final five minutes of the game but Blaz Emersic netted at 58.54 to finish the game 6-2.